We’re now just two days away from Samsung’s big Unpacked press conference, during which the company is expected to unveil not one but two new products. One is a new Galaxy Watch that will run Google’s Android-based Wear OS instead of Samsung’s Tizen operating system, which has powered the company’s previous-generation smartwatches. And the second is obviously the Galaxy Note 9, which will undoubtedly be one of the hottest new smartphones to launch in the second half of the year. Of course as we all learned with the Galaxy S9 and Galaxy S9+, power, performance, and a sleek design don’t always add up to big sales numbers. Samsung’s S9 and S9+ from earlier this year looked almost exactly like the previous-generation models, and they didn’t offer any compelling new features. As a result, they’re shaping up to be the worst-selling Galaxy S phones since 2012, since people don’t want to cough up all that cash for a minor, iterative update. Now, the question is whether or not Samsung’s bad year is about to become worse. Just about everything there is to know about the Galaxy Note 9 has already leaked. In fact, a leak just yesterday likely revealed all the little secret details that were left. The Galaxy Note 9 is shaping up to be just like the Galaxy S9 and S9+ in that it’ll be an iterative update wrapped in a housing that looks just like last year’s Galaxy Note 8. And if Samsung’s leaked launch plans are any indication, the company doesn’t seem confident at all in the Note 9’s ability to sell itself. Samsung had high hopes when it released the Galaxy S9 and Galaxy S9+ earlier this year. In fact, the phones launched with the highest price tags we’ve ever seen on Galaxy S phones, and Samsung’s launch promotions were far less appealing than the promos Samsung had run in the past. The company was confident that consumers would rush to buy them in spite of all that, but the opposite ended up being the case. In fact, the S9 and S9+ received an unprecedented price cut less than a month after they launched in the US. With the Galaxy Note 9, it appears as though Samsung will do everything in its power to avoid making the same mistake twice. At the same time, however, it looks like Samsung recognizes that like the Galaxy S9 and S9+, there’s no way the Galaxy Note 9 will be a big seller on its own. Samsung seemingly has a number of big promotions ready for when the Galaxy Note 9 is released on August 24th. We learned about a special value pack just yesterday that will include a pair of AKG headphones, a car charger, a car mount, and a protective case. Additionally, we know that Samsung has worked out a deal that will make its new phones the exclusive home of Fortnite on Android for up to 120 days, plus Note 9 owners will get between $100 and $150 worth of V-Bucks to spend in the game. Considering how hot Fortnite is right now, that deal undoubtedly cost Samsung a big chunk of change. Now, we’ve learned of yet another costly launch promotion that will run alongside the Galaxy Note 9’s release. 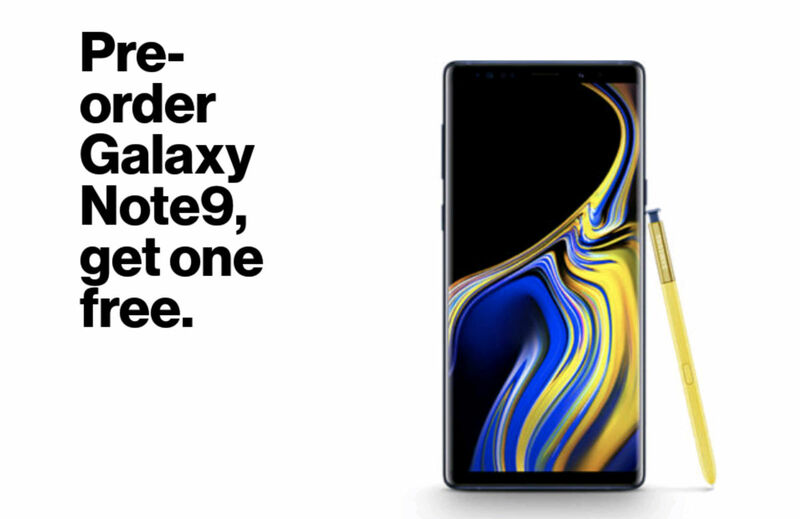 From day 1 — in fact, from even before day 1 — at least one major US wireless carrier is running a BOGO offer on the Galaxy Note 9. According to a report from Android blog Droid Life, Verizon will offer consumers who preorder a Galaxy Note 9 a second new phone for free. BOGO deals pop up all the time, but investing in such an offer right out of the gate is clearly an effort to boost sales volume. Considering the fact that the Galaxy S9 and Galaxy S9+ dragged down Samsung’s earnings in each of the last two quarters, we can’t say we’re surprised.